Industrial concrete floor coatings are an excellent choice for a high wear industrial or commercial floor system. We can resurface and finish new or existing concrete. Call 770-971-2778 to learn more. For most types of heavy commercial or industrial concrete floors the common requirement is high durability. The popular floor coating systems are urethane and epoxy products. Both are designed for high traffic applications where there is a need to make the surface impervious to liquid spills. In many applications our customers combine epoxy and urethane coating products. The epoxy concrete floor coating product serves as a resurfacing and/or floor primer. Urethane concrete floor coating products can be applied over this to boost aestetics and durability. In this scenario the durability is boosted because the urethane coating is bonding to the epoxy coating. Epoxy coatings bond better to concrete than urethane coatings. Colored and clear urethane floor coatings are very popular for industrial floor coating projects. 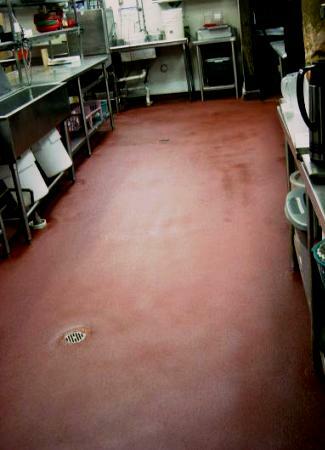 Urethane floor coatings offer exceptional performance characteristics. Among these are resistance to chemical spills, UV stability, abrasion resistance and overall durability. There are a number of products from which to use, depending upon the application. Urethane coatings are available as a high-solid, low VOC solution. Safety and directional floor markings are usually paint, specially designed pavement marking tape, or thermoplastic products. Most safety and directional markings are done by pavement marking and striping companies, and not by concrete finishers.